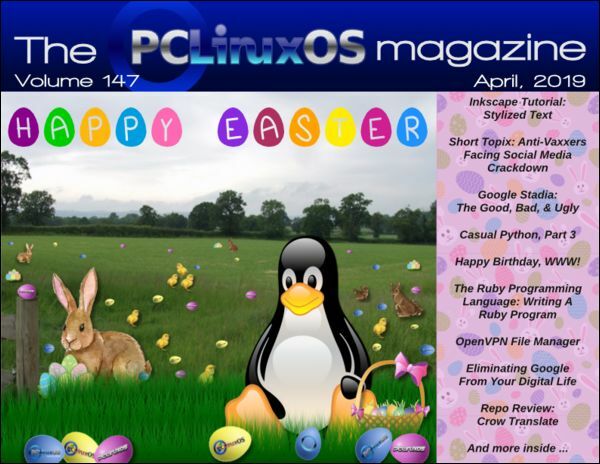 April 2019 Issue of The PCLinuxOS Magazine released. The deadline for the May 2019 issue is April 20, 2019.
magazine articles on our about page. R.I.P. Joble and TaraRains! All your PCLinuxOS friends and family miss you! Paul Arnote, a.k.a. parnote, is Chief Editor of The PCLinuxOS Magazine. Meemaw is the Assistant Editor of The PCLinuxOS Magazine. for PCLinuxOS users! Now expanded with a NEW Cryptogram Puzzle from ms_meme! A special thanks to YouCanToo for hosting The PCLinuxOS Magazine's new home! to create the HTML edition of The PCLinuxOS Magazine! 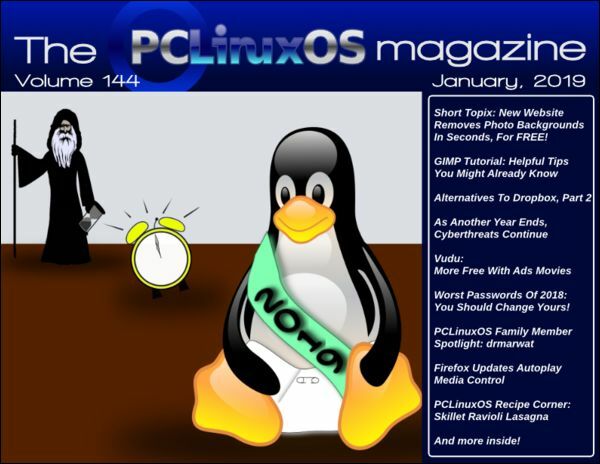 Download the NEW Epub & MOBI Ebook formats of The PCLinuxOS Magazine! Another special thanks to YouCanToo for creating them. ... in every issue of The PCLinuxOS Magazine! PCLinuxOS ... Simply Radical ... Radically Simple. Get your FREE copy today! 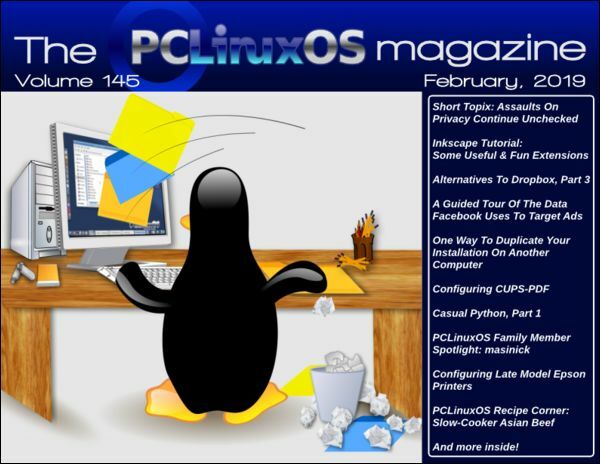 Want to see a screenshot of your desktop featured in The PCLinuxOS Magazine? Be sure to post it to the Monthly Screenshots section of the PCLinuxOS forum. Do you have an idea for an article? Would you like to submit an article? 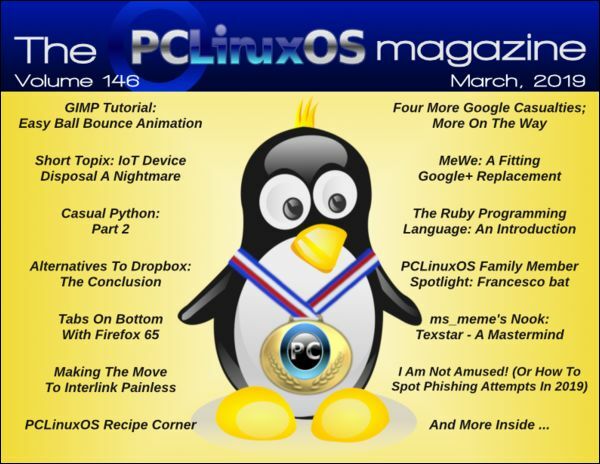 Let us know on the Magazine board in the PCLinuxOS forum! are maintained, and a link is provided to the originally published article. * And much more inside! This month’s cover was designed by Meemaw. This month’s cover was designed by Paul Arnote and Meemaw. * Short Topix: New Website Removes Photo Backgrounds In Seconds, For FREE! * Worst Passwords Of 2018: You Should Change Yours! Made with running on PCLinuxOS. Copyright © 2006 - 2019. All Rights Reserved. unique page visits since April 2012.